Lexis Practical Guidance in association with A R Sports and Events Pvt. 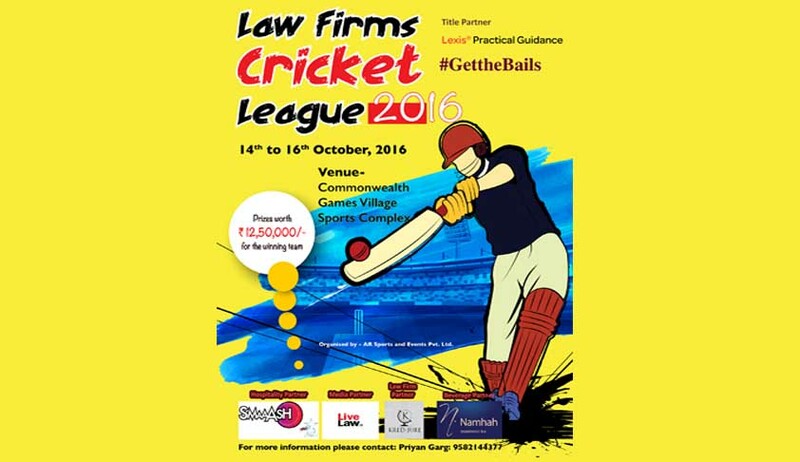 Ltd. will be organizing the inaugural edition of the Law Firms Cricket League from 14th-16th October, 2016. Taking into consideration the busy schedule of lawyers, the organizers have decided to keep the format short and will endeavour to complete the League within 3 days. The format of the league is based on the famous ‘Hong Kong Cricket Sixes’ tournament and the matches are to be played with pink deuce ball. All participating law firms will be divided in pools of 4 teams each. Each law firm will play a minimum of three matches in the group stage of the league and the pool topper and runners up would advance to the knock out stage. Each game will be played between two teams of eight players each. The Law Firm Cricket League is an exclusive day and night tournament. Each team will be provided with ten pairs of coloured clothing (T-shirt, Lower, cap) by the organizers. The matches would be played at the Commonwealth Village Cricket Ground, New Delhi. Speaking to Live Law, Mr. Priyan Garg, the member of the organizing committee, said that he is sure about the success of the league. The league will also offer lucrative prizes and rewards with prizes worth Rs. 12,50,000/- are up for grab. Man of the Match would be declared and presented after each match. Man of the series and other individual awards would be announced and presented at the presentation ceremony after the finals on 16th of October, 2016. The last date for submitting the Registration form by participating law firms is 26/09/2016. The list of participants, pools and fixtures would be announced on 27/09/2016. The organizers of the league have also planned a captain’s meet at Smaaash, Cyber Hub, Gurgaon, the Hospitality Partner of the League. The League is also sponsored by Kred-Jure and Namhah Tea. Live Law is the media partner of the Law Firm Cricket League. We have seen Law firms competing with other law firm when it comes to ‘billable hourly rates’ but it would be interesting to see what happens when these eminent lawyers will leave behind their bands, coats and gowns to compete for runs, wickets and sixes.